How can I invite my students to my workbooks without using their email addresses? This article describes how teachers can create accounts for their students without needing to use their email addresses. Teachers with a +Class View subscription can create and manage free accounts for their students to use without needing to use their email addresses. Students whose accounts are created in this way are called 'account members'. Account members do not need an email address to sign in and can be added to any of the workbooks you create. Write & Improve will never ask for account members' email addresses and won't allow them to change or delete their accounts. Their accounts will be managed entirely by the teacher. The account members tool can be found by clicking on Account members from the side menu, under the heading Class view. This option will only be available if you have an active +Class View subscription. (To find out more about +Class View and how to subscribe, click here.) Click on Account members. 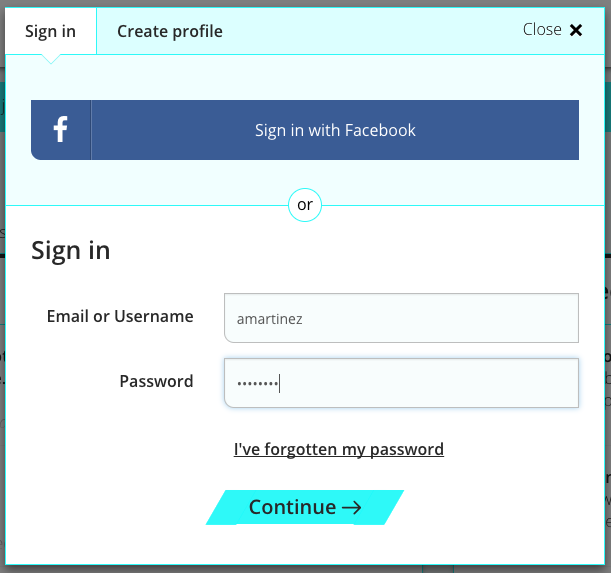 Now you are ready to create a username for each of your students. The username is what each student will use to sign in, instead of giving their email address. 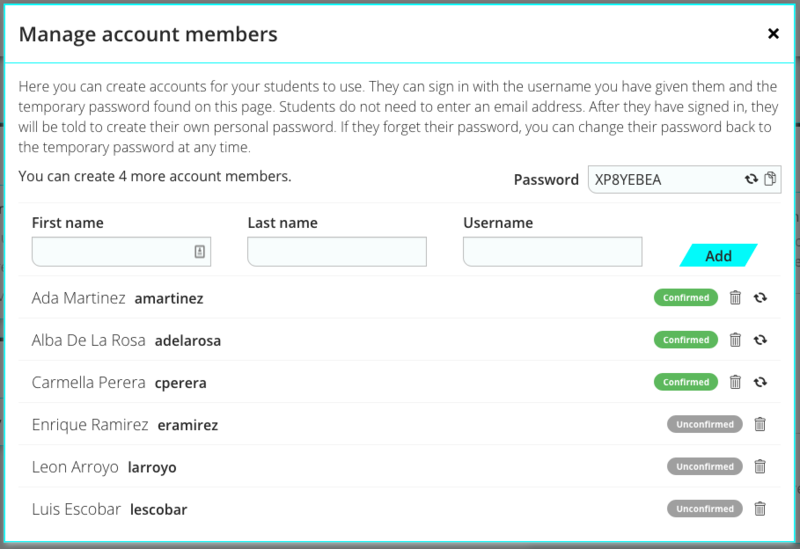 In the Manage account members tool, write the first name and last name of a student you want to add to your account. We will suggest a username based on the name you write, but you can change this to anything you prefer. You must complete all the boxes and the username must be unique to create the account. If the username you write is already in use, you will receive a different suggestion with a username that is not already taken. When you have finished, click Add. The account will be created and you will see the account member details listed below with the status Unconfirmed. Give the student their unique username and the password that appears in the Password box on the right. The account will be confirmed when the student signs in for the first time, enters their username and the password, and creates a new private password. Delete an account member to make a new student place available. To delete an account open the Manage account members tool, find the account you want to remove and click on the 'Delete' button. You will need to confirm that you want to delete that account member. An account member can sign in from the home page by clicking on the Sign in button. They do not need to create a profile like other learners. The form will ask for an 'Email or Username'. 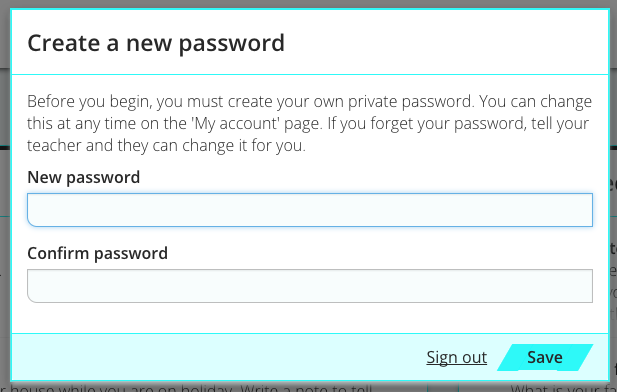 Here they can enter the Username you created and the Password given on the Manage account members tool to sign in. The temporary password applies to all Unconfirmed account members and can be changed any time by clicking on the 'refresh' button in the Manage account members tool. When the password is changed the old password will stop working and students with an Unconfirmed account will not be able to use it to sign in. You will need to give them the new password. Confirmed accounts will work as before, however. After the student has successfully signed in, they will be asked to create their own private password to sign in next time. When a password is successfully saved, the student will have access to the account and the status will show Confirmed in the Manage account members tool. If the student forgets their password, you can reset it in the Manage account members tool. Click on the reset button next to the details of the account you'd like to reset. The button will only be available after the student has confirmed the account. When the password is reset the account will change back to Unconfirmed status. The student will need to use the temporary password when signing in next time and will be asked to create a new private password again. Encourage your students to remember their passwords. You can add account members to any workbook you have created. On the workbook page, select the Add account members button in the Workbook members box. This will open the Select account members window. Here you will see a list of your account members. If you have not created any account members yet, you can do this by clicking on account members and return to add them later. Select any members you wish to add to the workbook from the list. When they have been successfully added to the workbook, they will be marked with the status Added. You will also see them added to the Workbook members list. 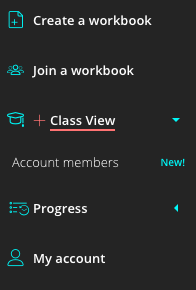 Like any other workbook member, you will be able to see all their writing, feedback and changes on the +Class view page. To remove the account member from the workbook, select the account again from the Select account members window. 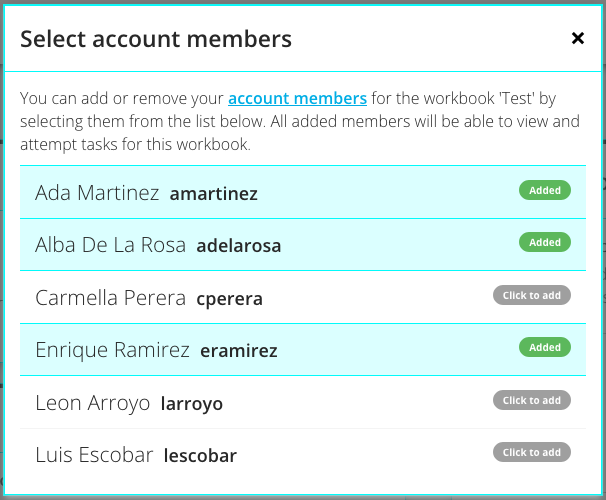 The Added status will be removed and they will be omitted from the workbook members list. You can also remove them using the delete button from the workbook members panel.